Leaky Shed Studio has such a great variety of chipboard and albums..... there is something for everyone. Hi! This is Debbie with you today and I want to share a layout with you that uses one of my favorite pieces of chipboard. It's the Ornate Corner but as you can see I used it as an embellishment to bracket a photo on the top and bottom. This is the raw chipboard piece before I painted it and embossed and painted some more! It gave the finished layout a perfect touch of dimension and romance. What do you think? Isn't it gorgeous and you can do so much with chipboard! It can be altered in many ways! 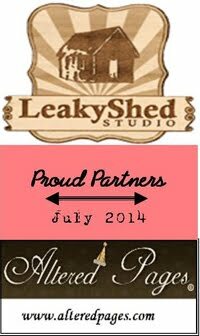 In the upcoming months we will have some videos and tutorials on fabulous ways to alter your Leaky Shed Studio Chipboard. Be sure and stop by and check out a few more layouts and projects over the next week. Did you see the Design Team Call??? Here it is again in case you missed it!! This is gorgeous!!! LOVING the colors and the flowers!!! !